You will receive a US local number or a US/UK toll free number. Just connect your Flexicalls Voiceline VoIP adapter to your Internet service and you are ready to make and receive calls. Take your adapter anywhere with you. Yes, anywhere worldwide that there is a high speed Internet connection you can use your Flexicalls Voiceline service. 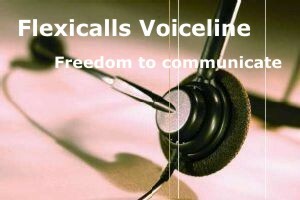 Flexicalls Voiceline is a prepaid service with no contract and no bill at the end of the month. A High Speed Internet connection such as cable, DSL or T1. A router that allows you to share your Internet connection. Plug your telephone into the Flexicalls Voiceline adapter and plug the adapter into your router. After a few minutes you will get a dial tone and you are ready to start saving.